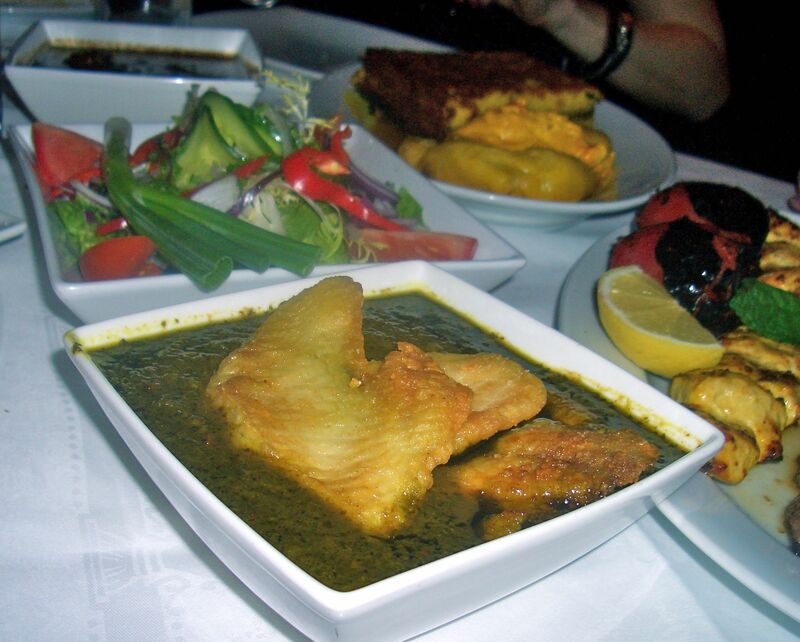 I was recently introduced to the wonder of Persian (Iranian) food for the first time when my friends Michael and Geraldine gave me the amazing book Saraban: a chef’s journey through Persia for my birthday. It’s a stunning book by Greg and Lucy Malouf with gorgeous pictures. stories of exotic places and tasty recipes. As luck would have it, I’ve also recently met someone whose family is from Iran. 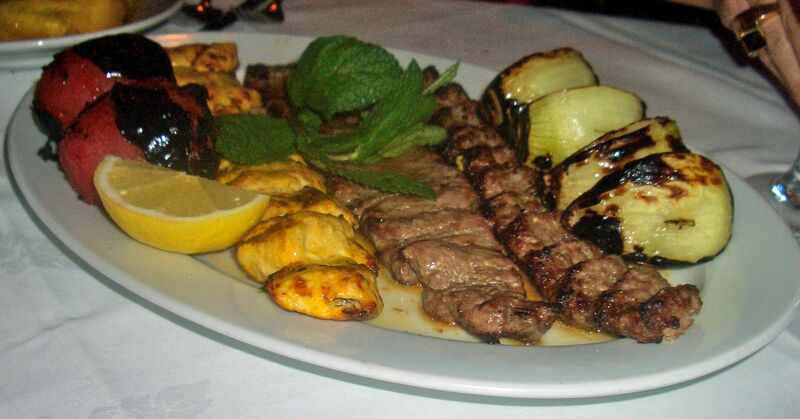 So when Yasamin (or Min as we call her) suggested we had a night out at her favourite Iranian restaurant in London, I jumped at the chance. Galleria is an intimate place just off Oxford Street and it was packed the night we went there. Good to see so many regulars tucking into their favourite dishes. Having very little knowledge of Iranian food, we were all happy to let Min do the ordering for us, which she did in great style, providing us with a real feast of dishes so we got a true feel for the food of Iran. So no menu quandaries tonight – perfect for me! We started with two yummy dips, Mast Mvusir, which is yogurt with finely chopped elephant garlic (sweet garlic) and Kashk-e badenjan which is aubergine and herbs in seasoned yogurt. We enjoyed the silken dips with warm flatbreads. 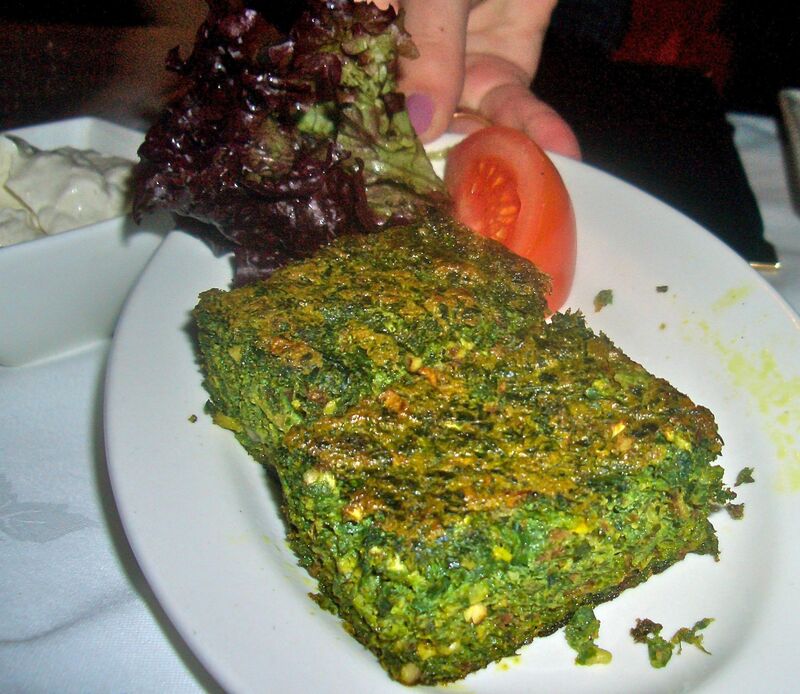 Min also ordered Kuki sabzi, which is described as a fresh herbs and walnut frittata. Something of a revelation, this amazing dish looks pretty dense but is amazingly soft, almost fluffy and beautifully herby. 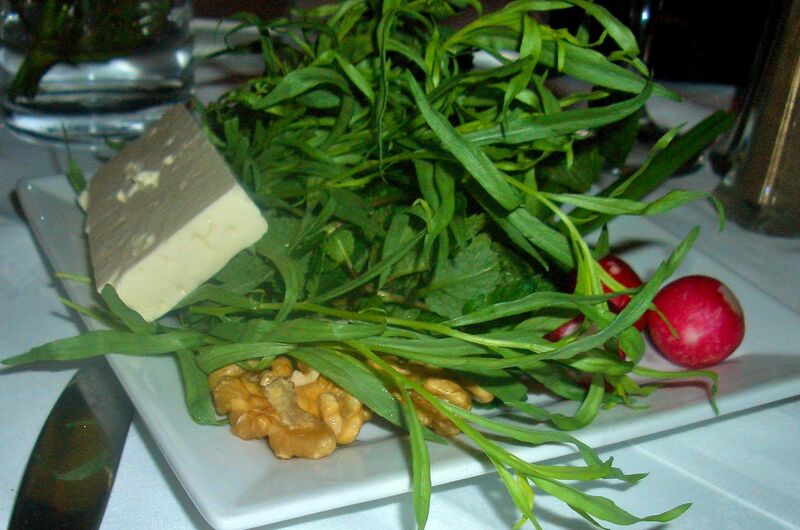 Our final starter was the Sabzi, serious bunches of tarragon and mint served with spring onion, radish and feta. The amazing fresh combination of flavours and textures was just perfect. For mains we had a tableful! Fesnjaan is chicken in an amazing walnut and pomegranate sauce. 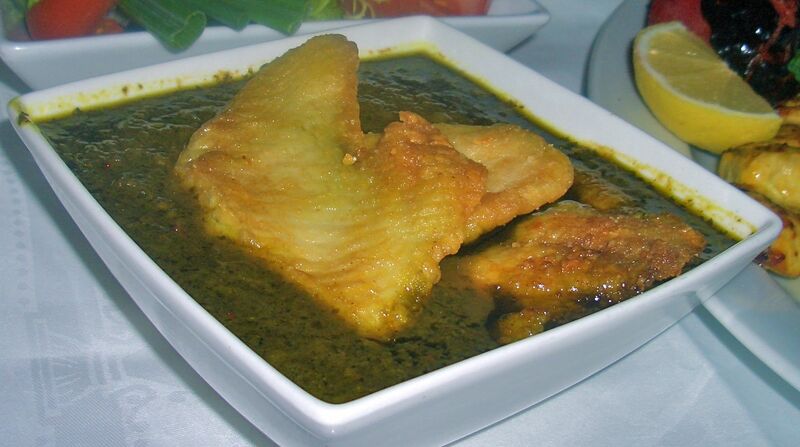 Galieh Mahi is tilapia in stew of mixed herbs, chilli and tamarind. The tilapia was quickly fried, hot, crispy and sweet, perfect combined with the sour and totally unique taste of tamarind. The mixed grill of chicken, beef and lamb came with roast tomatoes, which I was instructed to mash up into my rice before eating…a perfect combo. 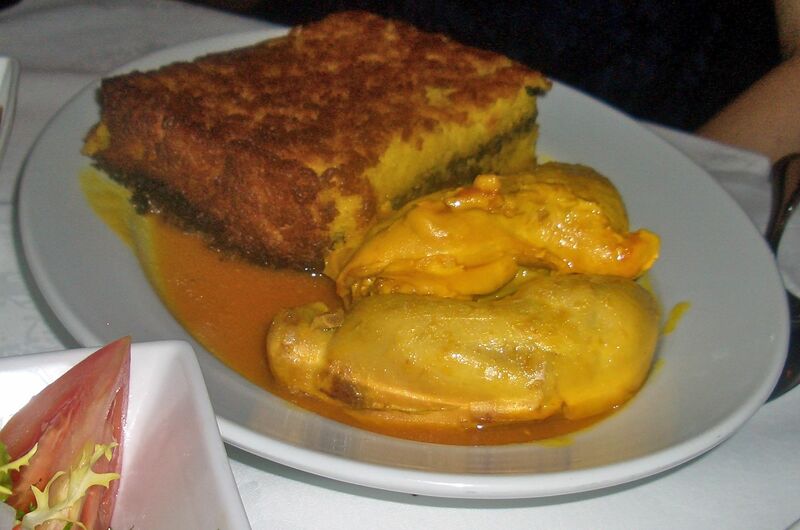 Tachin is chicken breast served with a kind of spinach and mushroom cake, topped with rice. 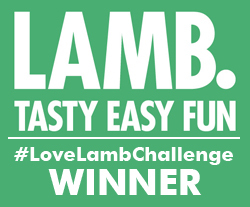 Rice and flatbreads were devoured in mopping up the juices. And then it was time for a jasmine tea. 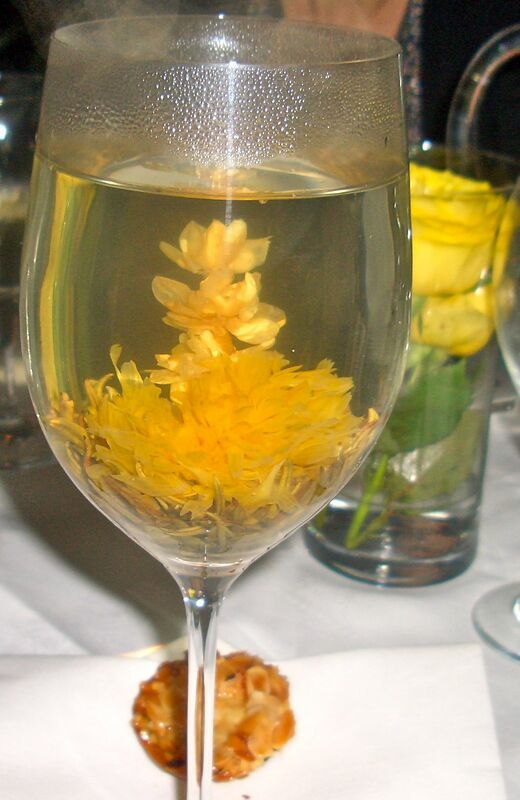 This amazing concoction arrived as a small dry, herbal bead in a large glass of boiling water which transformed into this flowery brew. Tastes and looks delicious. It’s best to go to Galleria with a group so you can try lots of dishes. I went with a great group of lovely ladies who I’ve been working with most of this year, all readers of my blog (not frequently enough though…). So thanks Jo, Sharon, Emma, Min and Tanya I love working with you and I love going out with you even more, let’s do it again soon. Thank you Min for a fabulous recommendation. And thank you London for having amazing international cuisine. Now I need to get Saraban out and plan my next dish to cook from it. Galleria is at 17 New Cavendish Street, W1. You sound like you work with great people Sandy. Indeed Jo, I am very lucky! Wow, I’ve never heard of this place. It sounds great. I’d highly recommend Ottolenghi’s Jerusalem book if you love food from this part of the world too! It’s really interesting and chilled. I love Ottolenghi, have seen the book in the shops and am very keen to buy it. Thanks for recommendation.